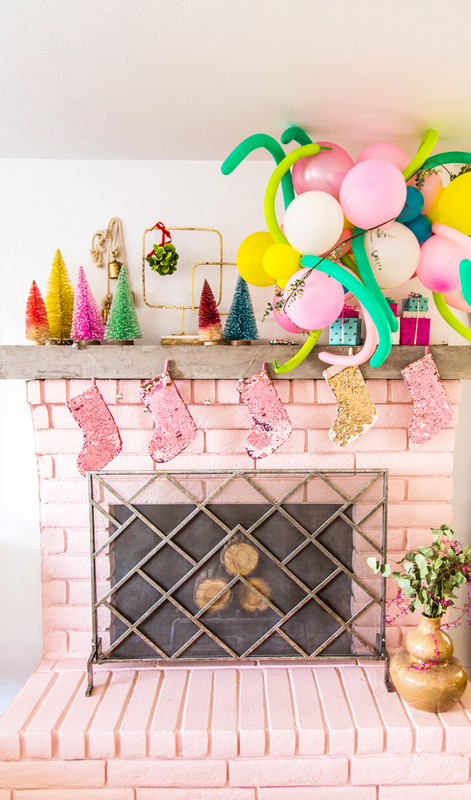 We’ve been using our pink fireplace as a jumping off place for holiday decorating this year. I think the pink Halloween mantel has been my favorite so far, until this! Christmas is coming in all it’s pink sparkly shimmer. 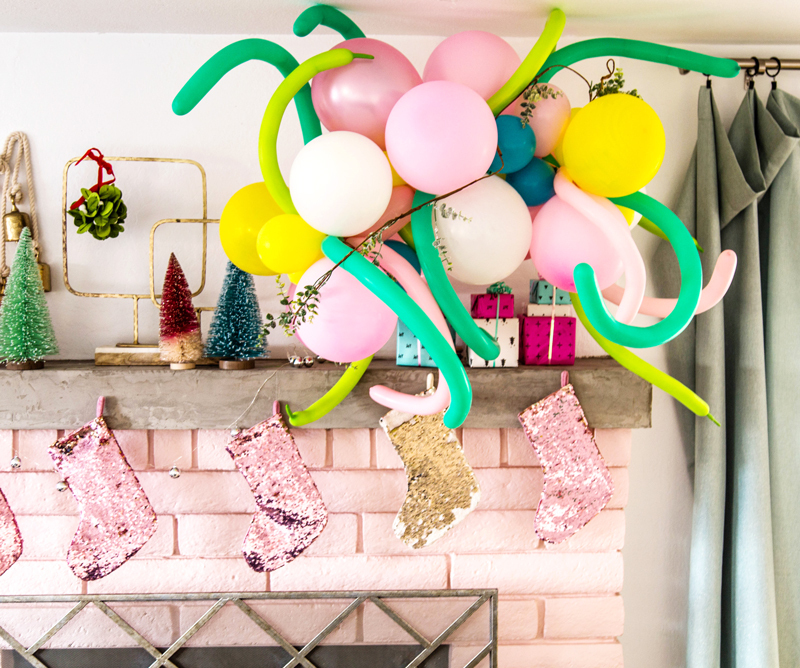 We created a festive tied balloon ceiling hanging that is very fun and it brings a bit of childhood whimsy to the mantel decor. Layered with festive trees, sparkling stockings and a few presents this mantel is ready for all the celebrations coming its way. 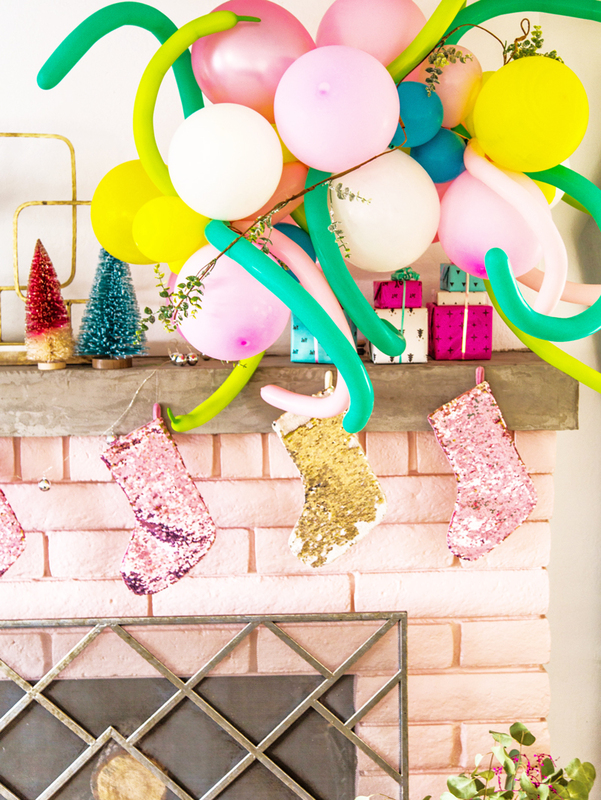 The tied balloon hanging is a simple way to incorporate a feeling of revelry into an everyday mantel display. It can be made and hung over just about anything – from a party table to a front porch. 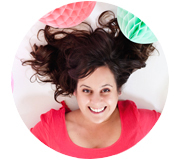 Balloons have always been one of my favorite ways to really quickly (and very affordably) bring any space to life. 1. Blow up all the balloons. 2. 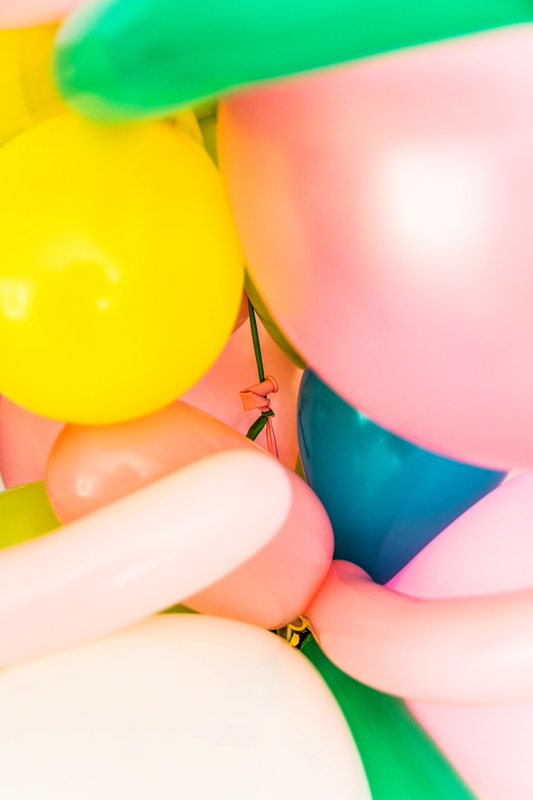 Tie the balloons first into pairs or triplets. We grabbed similar sized balloons and double knotted the ends together. 3. 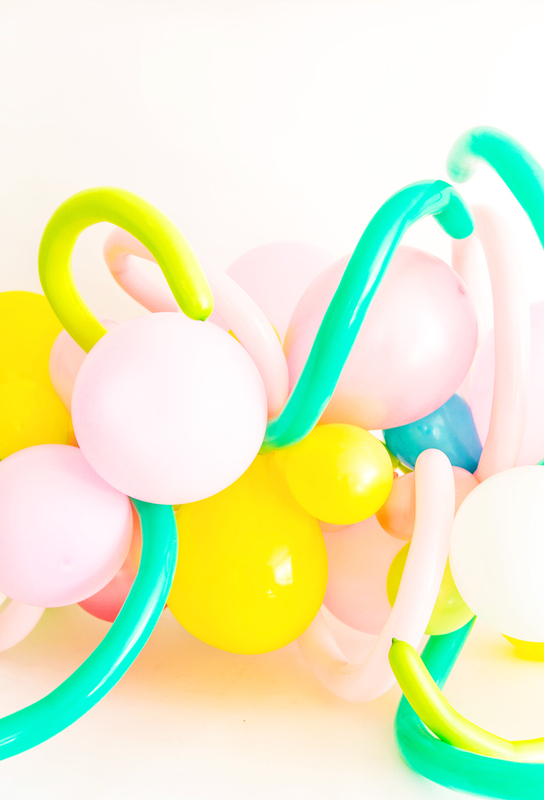 Grab two pairs and twist the balloons together to make a larger cluster. 4. 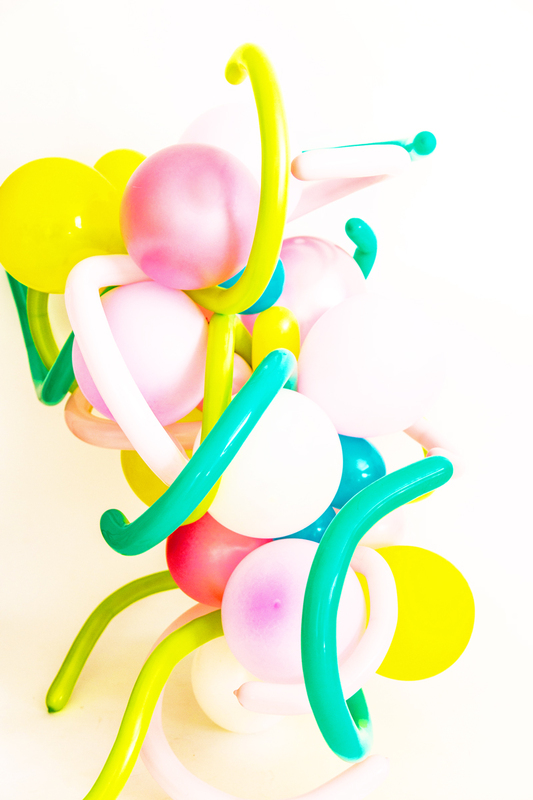 Continue adding smaller balloon clusters to the bigger cluster until you reach the size desired. This tied balloon hanging can literally be made in any size imaginable. Using larger, smaller and long skinny balloons creates a stunning display. 5. Wrap a piece of string or fishing line through the center to hang from the ceiling or wall. Festive in pink seems to be the theme we have going this holiday season and I have to say… it is the best. Plus, since both our kids birthdays are coming up in December this hanging will do double duty around our house as decor for… all the things! PS. Pink Christmas cookies to match. Wow! Very interesting post especially for the kids. I also love this type of creative work. And I also agree with you that to make this hanging balloon fishing line must be needed. Thanks a lot for sharing this post and keep continuing sharing such type of creative work with us! I’m gonna save this for my next Halloween and Christmas. My kids will love it especially the balloon thing. Thank you for sharing this diy.